Guitarist/ songwriter maurice Smith , violinist/ accordianist Jacoba Epstien and bassist Kevin Clark present original compositions and songs of the American and Parisienne songbook. 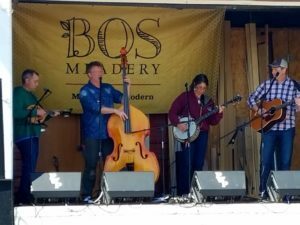 Come enjoy an evening of live local Bluegrass & acoustic Americana at Bos Meadery as Bluegrass TeA & Company and The Strung Up Four share a stage together. Friday night is music from my straight ahead quartet (prior 3 albums) and Saturday will be music from my latest Elektra CD.